John Ortolani has worn many different gloves during his career in athletics. 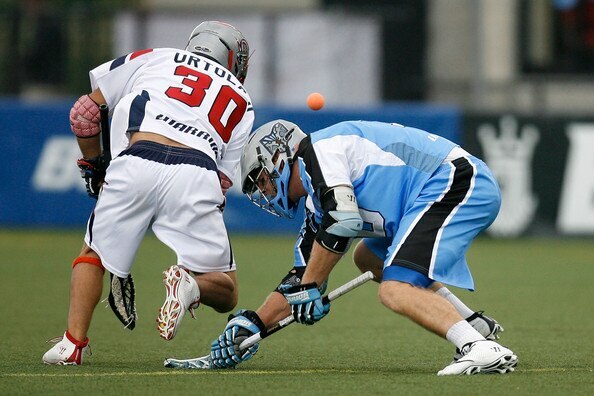 In 2009, he signed with the Cannons to begin his professional lacrosse career. That same year, he became a professional Mixed Martial Arts (MMA) fighter. In 2016, he started boxing professionally. No matter what pair of gloves Ortolani had on, he’s had a unique career overall. Ortolani, a Massachusetts native, spent four seasons with the Cannons, mainly serving as the backup face-off specialist to Chris Eck. Although he only played four games in a four-year stint with Boston, Ortolani enjoyed his time playing for his hometown team, especially after he grew up rooting for them. Ortolani was traded by the Cannons to Rochester in 2013, where he was the starting face-off specialist for two seasons. In 2014, he made the All-Star Team and helped bring Rochester to the championship game. Then, an unfortunate motorcycle accident in 2015 caused Ortolani to miss the first four games of the season, and he was never 100% after returning to the face-off-X. He suited up in six games for the Florida Launch in 2016 but has not appeared in an MLL game since. He spent the 2017 season on New York’s roster and went unsigned during the 2018 season. Ortolani first developed an interest in fighting when he was in high school as a member of the wrestling team. During his college lacrosse days, he used MMA training to stay in shape during the off-season. A friend of his was fighting at the time, so Ortolani trained with him and discovered his niche. Ortolani remembers his first fight in mixed martial arts quite well. He was training at his gym on a Thursday night in February of 2009 when a promoter showed up looking for a favor. Somebody had pulled out of a fight that was schedule for that Saturday and the promotion needed a substitute. So, Ortolani spoke up and offered to fill in, despite having just a few months of training and two days to prepare. When Saturday arrived, the short notice did not affect Ortolani one bit. He defeated his opponent in 47 seconds via submission and immediately fell in love with the sport. Since then, he’s posted an 8-13-0 record in MMA competition. Growing up, Ortolani always wanted to compete in a New England Golden Gloves competition, but the timing never worked out because of his MMA fights, and he lost his eligibility after turning pro. When he was finally offered his first chance to box professionally in September of 2016, Ortolani jumped on the opportunity. Now, after 42 games in the MLL, 22 MMA fights, and one boxing match, Ortolani is preparing for his second career boxing match that is scheduled to take place on November 21 in Windham, New Hampshire. He is scheduled to take on Ian Beatease in the Thanksgiving Eve Boxing Spectacular hosted by Boston Boxing Promotions. Ortolani has taken everything he learned from his last boxing bout and has applied it to his current training. “I’ve had a full eight weeks of training for this fight, as opposed to the two weeks I had for the last one,” he said. “I fixed a lot of holes that I had. I feel confident going into this one. I feel good, nice and tight, and strong. I’m excited. Furthermore, Ortolani has been able to pick apart the differences in training between MMA and boxing. In MMA, kicking and grappling play a significant part in each fight, whereas in boxing, fighters only have two tools. Ortolani admitted that his arms tired quicker than he anticipated in his first match, as he was used to the MMA style of having more than two options to pick from. He also noticed the differences in footwork in the two sports. In MMA, he bounces on his toes and there is more calve work. In boxing, his upper legs were worked out more from the stepping and ducking, but also because punches generate from the legs. Thus, Ortolani incorporated some new techniques into his training. Lower-body strength was more of a focus this time around, as he worked on improving the strength in his quads and hips. He also did more shoulder work so he’s able to keep his arms raised for longer periods. Overall, he increased the intensity in his boxing-specific workouts and did not go as hard during his other exercises. The fights themselves are also different. Ortolani said that he’s had to think of some “creative ways to open up” his opponents in boxing, because the kicks and take-down attempts he can use in MMA don’t apply in the squared circle. The differences between the two sports make it hard to prefer one over the other, but Ortolani said he thinks MMA is his favorite because he loves to wrestle and grapple. He takes the boxing opportunities because it allows him to learn the technical skills that will make him a better fighter when he returns to the MMA cage. Ortolani, who is also an instructor in Brazilian Jiu Jitsu at RMNU South Tampa, also said one of the main reasons he participates in these fights is to pass the experience on to his students. As for lacrosse, Ortolani isn’t done playing just yet. The 32-year-old said he hopes to find himself back in the MLL after spending the past few years concentrating on his fighting. Whatever gloves Ortolani decides to put on next, there’s no denying that his eagerness to compete is evident.